World Cup Semi-Final: England V. Croatia, Winner Will Play France The winner of Wednesday's World Cup semi-final between England and Croatia will advance to Sunday's championship match against France. 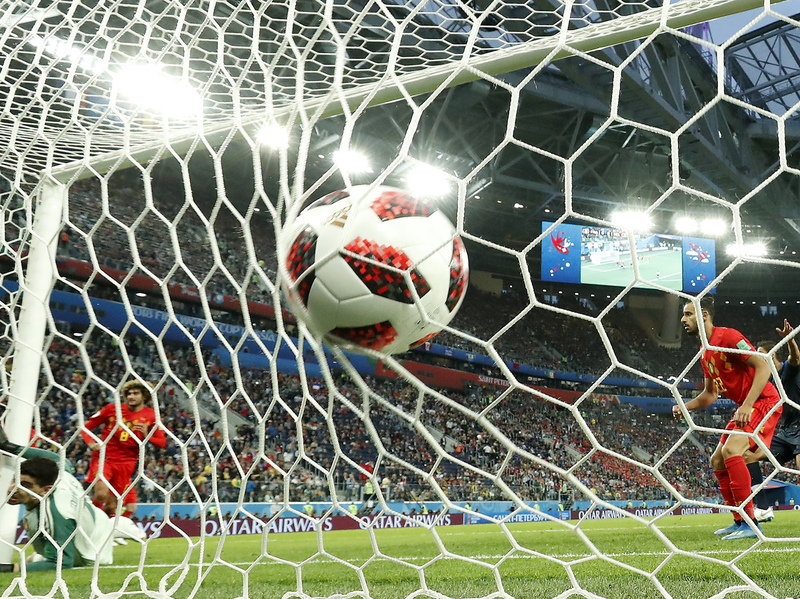 Belgium goalkeeper Thibaut Courtois, left, is beaten by a header from France's Samuel Umtiti for the opening goal during the semifinal match between France and Belgium at the 2018 soccer World Cup in St. Petersburg, Russia on Tuesday. If England is to advance, it will have to get through Croatia, which has its own history of World Cup futility. Croatia has never advanced to the championship match. And the last time it played in the final four was 20 years ago, in 1998. That year, France both hosted FIFA's World Cup and won, beating Brazil 3-0. NPR's sports correspondent Tom Goldman says today's match is being played against a political backdrop. He told NPR's Newscast Unit that many Russians are angry at Croatian defender Domagoj Vida for appearing in videos saying pro-Ukrainian slogans. Goldman says FIFA, the international soccer's governing body, has warned Vida about making political statements. The BBC says one of the two videos in which Vida appeared was posted online after Croatia beat host Russia for the right to play in the semi-final against England. A separate video led to a Croatian coach being sent home. In the end, neither Croatia nor England was expected to make it this deep into the tournament, but here they are and France is waiting.